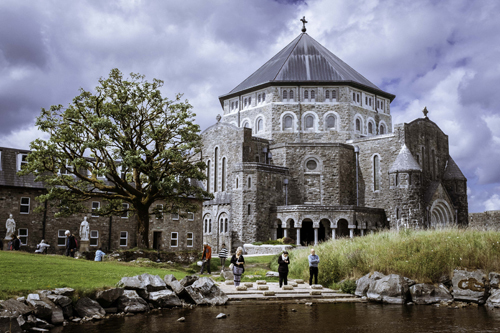 Filmed during the summer of 2018, this three-part series documents a 12-week season on the sacred site of Lough Derg, Co. Donegal. Made by DoubleBand Films for BBC Gaeilge and RTÉ with support from Northern Ireland Screen’s Irish Language Broadcast Fund, Oilithreacht (Monday 25 March, 10pm, BBC Two Northern Ireland) follows people young and old, as they undertake the challenging three-day pilgrimage of fasting, vigil and prayer. The series explores what motivates people to take part in this centuries-old mission to an island which dates from the fifth century and where, it is said, Jesus showed St. Patrick a cave that was an entrance to purgatory. For some, it is a way of attempting to deal with a personal issue or strengthen their faith. For others, going on the pilgrimage is a long-standing family tradition, or an opportunity to ‘detox’ from the modern world. Oilithreacht captures the physical challenges that the pilgrims grapple with as they maintain a 24-hour prayer vigil and go barefoot and without food – with the exception of dry toast – throughout their three day stay on the island. It also reflects on how the pilgrimage to Lough Derg has seen reduced numbers in recent years yet still manages to reach out to young people, often those seeking a form of release from the stresses and pressures of contemporary living. As well as pilgrims, the series introduces us to the staff who work on the island and the clerics who explain that while the island has traditionally been seen as a place of purgatory and penance, it is also very much a place of reconciliation, healing and for some, a new beginning. Capturing the pilgrims’ joy and sorrow, their camaraderie and the suffering, the series delivers an insight into what a pilgrimage still means to people today and the various reasons that compel them to visit Lough Derg. Oilithreacht, Dé Luain, 25 Márta, 10i.n, BBC Two Northern Ireland. Sa tsraith trí chlár seo a scannánaíodh le linn shamhradh 2018, déantar taifeadadh ar shéasúr dhá sheachtain déag ar thalamh naofa Loch Dearg, Co. Dhún na nGall. Sa tsraith Oilithreacht (Dé Luain 25 Márta, 10 i.n., BBC Two NI), a ndearna DoubleBand Films í a léiriú do BBC Gaeilge agus do RTÉ le tacaíocht ó Chiste Craoltóireachta Gaeilge Scáileán Thuaisceart Éireann, leantar daoine óga agus daoine aosta agus iad ag tabhairt faoin oilithreacht dhúshlánach trí lá den troscadh, den bhigil agus den phaidreoireacht. Sa tsraith seo, déantar fiosrú ar na rudaí a spreagann daoine le bheith páirteach sa mhisean seo a bhfuil na céadta bliain de stair ag baint leis, chuig oileán atá ina áit naofa ón chúigiú haois agus, de réir an scéil, an áit a thaispeáin Íosa pluais do Naomh Pádraig a raibh bealach isteach sa phurgadóir ann. Do dhaoine áirithe, is dóigh é le déileáil le fadhb phearsanta nó lena gcreideamh a neartú. Do dhaoine eile, is traidisiún teaghlaigh seanbhunaithe é, nó deis le ‘díthocsainiú’ a dhéanamh ó nimheanna éagsúla shaol ár linne. Déantar cur síos go mionchruinn in Oilithreacht ar na dúshláin fhisiceacha a mbíonn na hoilithrigh ag dul i ngleic leo agus iad ag coinneáil bigil phaidreacha 24 uair an chloig, cosnocht agus gan bia ar bith a ithe – ach amháin arán rósta tur – tríd an tréimhse trí lá a chaitheann siad san oileán. Déantar machnamh ann fosta ar an dóigh ar tháinig laghdú ar líon na ndaoine atá ag dul ar oilithreacht Loch Dearg le blianta beaga anuas, ach go fóill féin, éiríonn leis an oileán freastal a dhéanamh ar dhaoine óga, cuid mhór acu daoine óga atá ar lorg fuascailt éigin ó strus agus ó bhrú shaol na nua-aoise. Chomh maith leis na hoilithrigh, cuireann an tsraith in aithne dúinn an fhoireann a bhíonn ag obair san oileán agus na sagairt a mhíníonn dúinn, cé go n-amharctaí ar an t-oileán go traidisiúnta mar áit phurgóide agus aithreachais, is an-áit é fosta don athmhuintearas, don tslánú agus, do dhaoine áirithe, áit a bhfuil tús úr ar fad le fáil. Léirítear áthas agus brón na n-oilithreach sa tsraith, a gcomrádaíocht agus an méid a fhulangaíonn siad, agus tugann an tsraith léargas ar an tábhacht atá ag an oilithreacht do dhaoine sa lá atá inniu ann agus na fáthanna éagsúla atá á spreagadh le cuairt a thabhairt ar Loch Dearg.